View of “Richard Hughes,” 2012. Over two walls of the expansive gallery housing Richard Hughes’s largest exhibition to date, “Where It All Happened Once,” a network of rusting pipes spelled out the word NOWHERE. 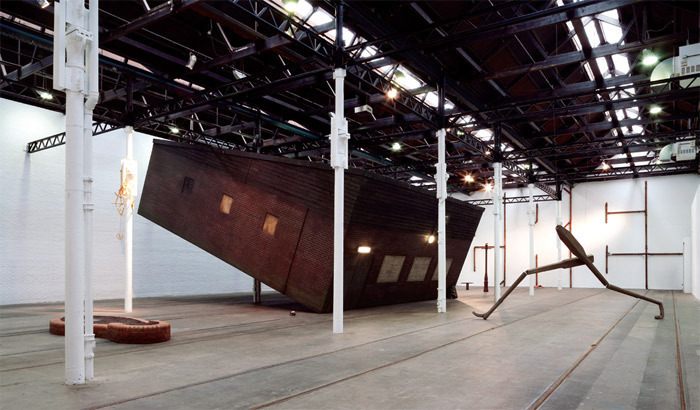 Titled Sleeping Rust, 2012, this piece suggested a regional hinterlandforgotten and neglectedas the context for the other works in the show (several new, with others made over the past six years). But then again, it could be read as “now here” as easily as “nowhere,” this shifting meaning a subtle reminder that the exhibition might resist an easy or singular interpretation.